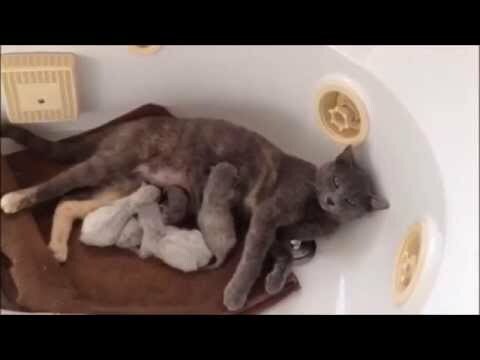 →How Many Kittens Are In A Litter? What To Expect When Your Cat Is Expecting? My cat Oliver got pregnant a few years back, and it was the most wonderful experience of my life. The 9 kittens that she bore were the cutest balls of fur and have since come very close to my heart. It was during the period of my cat’s pregnancy that I was most tensed and inquisitive like any other cat parent would be. I was constantly fussing over my pregnant cat and tried to gather as much information as possible on the subject of cat pregnancy from friends, family, and various online sources. To answer your query on the above problems, I have thus prepared a well-researched and well-encompassing advice, for the benefit of all cat parents out there, who are fussing and worrying about their precious furry friends. What influences the size of a cat litter? When your cat starts to bear new kittens, there are in fact a number of factors that can manipulate how many kittens are in a litter and how many she would deliver. Getting to witness a different being arrive fresh into the world is a pretty incredible experience, whether animal or human. The first kitten birth that I witnessed was of my street cat, Oliver, delivering her earliest litter of tiny kittens when I was 15 years of age. I took one of them to my home and even bathed them. And, after this, I used Quick Bath Cat Wipes to clean the cute kitty. According to veterinarians, how much the cat is bred can influence the litter size of a cat. Cats are reflex or induced ovulators, that is, breeding induces or stimulates the release of eggs or ovulation from its ovaries. The more breeding the cat does, the more kittens it bears, even if they are fathered by different cats. Experts say that the age of the mother cat affects her litter size. Although the average size of a cat litter is 3 to 5 kitties, if the mother is young or if it is her first time giving birth, she will have nearly 2 to 3 kittens. On the other hand, a cat that is 3 or 4 years old will most probably have nearly 4 or 5 kittens in one litter. Additionally, with age, the regular size of a cat litter decreases. Generally, cats can have a maximum of 3 litters in a year. If the cat is unhealthy or suffering from any trauma, then its litter can be aborted, either a few or all of it. Some cat infections can also affect the number of kittens a cat produces and their life, including parasitical, viral, and bacterial infections. For instance, feline infectious peritonitis (FIP) changes the ability of the kitten to thrive or diminishes the fertility of the infected cat. Besides, pregnant cats suffering from feline distemper or feline panleukopenia virus (FPV) can get their litter aborted, reduced litter size at birth, or stillborn kittens. Similar to human beings, the nutritional state of the mother cat can also alter her pregnancy outcome as well as her kittens’ health. If the mama cat is malnourished or starving, then it can have more stillborn kittens rather than viable ones. The genetic heritage of both the father as well as the mother cat influences the size of the cat litter since some breeds can breed more kittens at one time. For instance, Persian-type cat breeds generally have smaller litters, Siamese-type breeds usually have larger litters, and Manx felines often lose a quarter of its kittens in each birth in case of tailless to tailless birthing. In addition, the Abyssinian breed has an average of 3.5 kittens per litter and the Burmese breed has more or less 5 kitties in every litter. Additionally, cats that are produced after a lot of inbreeding will have smaller litter sizes. Thus, these are the factors that influence the size of the litter of felines. You can look for these points in your cat and speculate how many kittens she will have in the near future. Or else, you can just wait for her to produce kittens. Unlike human beings, cats do not have to keep their babies for 9 months in their womb, which can be the reason why they have multiple babies every time. Cats are generally pregnant for nearly 9 weeks only. And, when the half of this period is over, that is somewhere around 4.5 weeks, then the vet can feel as well as count the number of kittens during a regular examination. The vet just has to press the tummy of the cat lightly and note the number of embryos it has within it. Through an X-ray or ultrasound, the size of the cat litter can also be determined. However, the better way to do this is through an X-Ray rather than an ultrasound. Ultrasound can tell if the cat is carrying a child. It can also tell the number of kittens the cat has in her belly, but it wouldn’t be so accurate. Since the small bones of kittens are formed when the cat is around 54 days pregnant, an X-Ray shows a transparent picture of the imminent blood of the cat. If you do not wish to be acquainted with exactly the number of kittens your furry friend is pregnant with, it is okay to hang around until the big day. There is always the chance for you to otherwise make a guesstimate through the average quantity of kittens that cats generally give birth to. A typical litter quantity can range anywhere from 1 to 5 kittens. However, there are some exceptions to the rule. A few cats are capable of having up to ten kittens and some litter bulks have been accounted to be as towering as 19. Thus, through these ways, you can know the number of kittens your cat has in her litter. Nevertheless, it is vital to estimate the size of your cat’s litter since a small litter can result in birthing issues. By using these methods, you can know how many cat homes or tiny booties you will have to make for the kittens. Regardless of the number of kittens that your feline friend is presently carrying, the most vital need for a mother cat and her litter of kittens is a balanced and healthy diet. You must go on to discuss the pregnancy in detail with your vet so as to make certain that her food intake is providing the adequate nutritious elements, both for the mother and her tiny family. The vet can appropriately advise you to boost the sum of food intake for your cat, in addition to the amount of times in a day for the feeding. As these kittens start to grow they would take up more space in your cat’s midsection, thus creating difficulty in eating a lot at a single sitting. However, she will still require this nutrition and extra food than usual. Hence, your cat will welcome more recurrent meals, particularly as her delivery date draws nearer. You must know that every kitten would have their own placenta that may not come through along with the kitten. You could keep a track of these placentas and make sure that they are equal to the number of kittens produced. In case only 2 placentas come out from 3 kittens, there may be one stuck in the mother cat, which can bring about an infection. When you see a missing placenta, you must get your cat immediate medical attention. Provided that your cat is tending to her babies and the kittens are able to breathe on their individual capacity, you will not have to intervene. In fact, an excess of traffic or interference in the birthing area can possibly even sidetrack her and eventually delay the delivery. After everything else, make certain that the mama cat has enough water and food near the birthing area. She would have to eat properly to let her body produce an abundance of milk to feed all of the meowing packages of joy. Experiencing a cat birthing is an amazing and humbling feeling indeed and it is an honor to witness this on my part. Your mama cat must also be pretty exhausted after the birthing and hence would need a lot of rest immediately after. You can entertain the little one through a number of playful items online or you can even create your own homemade toys. In addition, if the cat produces a big litter, it may not have a sufficient milk supply. In this case, these kittens may require supplemental feeding through another queen or through feeding tubes or bottles.